We invite you to join our Arctic Holiday during your next trip to Tromsø. We'll tailor your itinerary according to the arrival time, preferences, and other specifics while taking care of your accommodation as well: a centrally-located hotel will be waiting for you upon arrival. Each and every package is designed to maximise your chances of witnessing the Northern Lights whilst turning the trip into a carefree vacation. Among other things, we are making room for adequate rest & free time. We go on several Northern Lights chases and you get to join local day trips, including a Dog Sledding adventure on the snowy expanse of Kvaløya island. You may further decide between dashing through off-road, alpine landscapes on a snowmobile, or visiting a sustainable Black Angus farm. The latter helps you discover how caring and innovative cattle raising really works; during that trip, you can dine on authentic farm food while enjoying fjord & mountain views from the living room! You have enough time to rest, wander around Tromsø and get acquainted with the city a little bit better. We are happy to help you find a restaurant, suggest different sights to see, and make the most out of your stay in Tromsø. This package is ideal for really maximizing your chances for seeing an especially impressive display. All our packages are flexible as you can add or remove day trips, Northern Lights chases, etc. Feel free to let us know about your preferences! Price quoted is for a standard double or twin room to be shared between 2 persons. 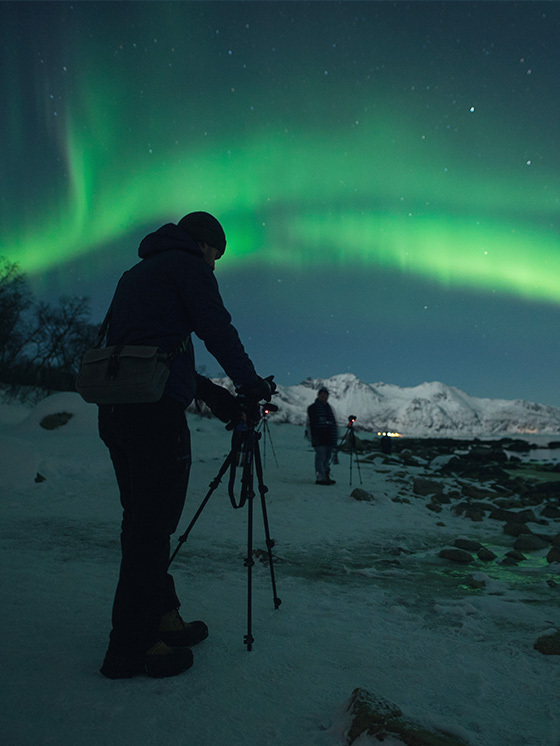 To help our guests maximize their stay in Tromsø and their chances of seeing the Northern Lights, we have a unique flexible itinerary feature for our package holders where a seat is reserved for you on our Northern Lights chases every night of your stay, and you will have the option of rescheduling your existing chases or adding additional ones without worrying about the availability on our chases. Packages also include the option to cancel your Northern Lights chases for a full refund, for example, if you feel that you’ve seen enough after the first chase. Simply tell us that you’d like to reschedule or cancel your next chase before 06:00 in the morning, on the day of the tour. In the event that any day- or night-trip cannot go as planned due to weather conditions, you will also be offered priority to alternatives where available and we will manage the rescheduling of your itinerary based on your preferences. Interested in our packages but this is not suitable? All our packages are flexible as you can add or remove day trips and Northern Lights Chases.